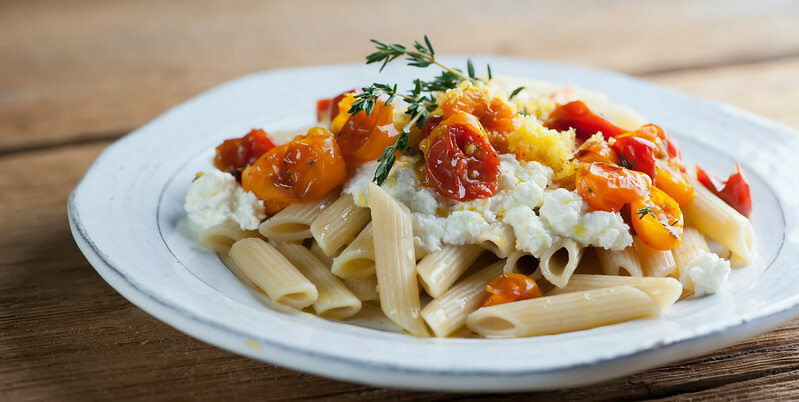 This easy recipe for penne with roasted tomatoes and fresh ricotta gives a whole new meaning to pasta with tomato sauce! Simple and delicious. I just LOVE this recipe. It is simple and fast and so so so delicious. You can serve it hot or cool – it is completely flexible and agreeable. The one thing you absolutely MUST do is have is fresh and wonderful everything. Okay, the pasta can come out of a box, but the rest of it? Must be fresh. The little bits of lemon peel that you see on the top? Shaved off the lemon 2 minutes before the plate hit the table. The tomatoes? I had a whole dish of these babies…. I ate the green and the yellow ones, but the red ones got roasted with some fresh thyme and some fantastic olive oil. A good olive oil can make your whole life better. And then we come to the ricotta. Now, before you read the rest of this post, please know that fresh ricotta is readily available in many places, including Whole Foods. And if you really must, you CAN use supermarket variety ricotta in this dish. But I made my own ricotta for this recipe, and if you have an extra ten minutes and a couple of easy ingredients, you can too. I promise! Honestly, the hardest part of the whole ricotta-making process was taking that picture with the drip coming out of the cheesecloth bundle at exactly the right time. The rest of the ricotta-making process? Ridiculously easy. Ridiculously fast. And ridiculously delicious. Once you make it, you will never buy the store bought kind again. So if you want to give ricotta-making a whirl, click here for my super easy recipe. Salt it lightly and let it drain for only 5 to 10 minutes if you (like me) like your ricotta creamy. Or, just run to Whole Foods and buy some…but I promise you that making your own is actually a snap. Once you have some ricotta, roast up some cut up cherry tomatoes that are tossed with olive oil and salt and pepper. 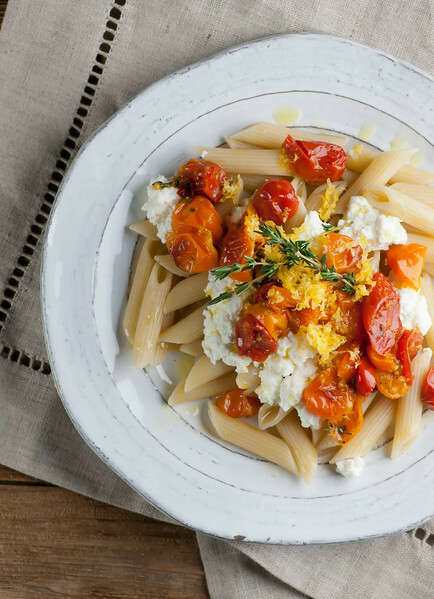 While the tomatoes are roasting, cook the penne until it is al dente, and then stir in just enough olive oil to keep it from sticking. Spoon it into bowls and top with some of the tomatoes, a few spoonfuls of the ricotta, some freshly grated lemon peel, some fresh thyme leaves, a little coarse salt and a grinding of fresh pepper. That’s it! It’s also lovely at room temperature — just let the pasta cool off for a little while after you add the olive oil and then proceed with the rest of it. See? A whole new meaning to pasta with tomato sauce! Preheat oven to 425º F. Line a rimmed baking sheet with foil and lay the tomatoes in a single layer. Drizzle with a little olive oil and sprinkle with salt and pepper. Roast until soft, about 20 minutes.Set aside to cool. Toss the pasta with a little more olive oil and divide among bowls. Spoon some the ricotta over each serving and top with some of the tomatoes and thyme sprigs. Drizzle with a little more olive oil and sprinkle with lemon zest and a grinding of pepper and serve! I love ANYTHING pasta and this is no exception! I will be making this! And I never ever ever thought about attempting to make my own ricotta…but I'm going to now! I think I can do this! Thanks for sharing! It looks so good. I must try this ..
What an incredible spring inspired pasta creation! Im loving the fresh ricotta and beautiful roasted tomatoes! Gorgeous pasta dish! Homemade ricotta must taste unbelievably delicious, especially when paired with sweet roasted tomatoes. This tasted as amazing as it looked! I did add some pan-fried kolbasa to the mix because my family couldn't fathom a meatless dish! Thanks for the wonderful post! Next time, I'm trying it with the home-made ricotta! Looks DELICIOUS! So delicious I bought everything I need to make it tonight, with the exception of using whole grain penne. Well, Oh my gosh. I had never made pasta(although I owned a pasta machine) or ricotta before and this was just delicious. And so much fun to make! Thanks for inspiring me with a photo. This was easy to make and soooo tasty to eat! its amazing!i loved it! Homemade ricotta is by far more impressive than storebought! Love the fresh flavors of this recipe, it looks beyond tasty! Isn’t homemade ricotta the BEST? Yum.